Official support for one of the most requested features in iOS has finally arrived. With iOS 8 (available for download today), Apple for the first time ever opened their mobile OS up to third-party keyboard developers and as you might expect, there’s no shortage of popular keyboard apps now vying for your attention in the App Store. As of writing, a number of apps are already available to download including Swype, SwiftKey and Fleksy. Swype allows users to type with a single hand as you simply drag your finger across the keyboard to spell out words. That probably sounds pretty difficult but it’s pretty easy to get the hang of if you’ve never tried it. With over 250 million users worldwide, you can rest assured that updates will come on a regular basis. It’ll set you back $0.99 and is available in English, French, Italian, German and Spanish. Unlike Swype, SwiftKey is being offered free of charge. 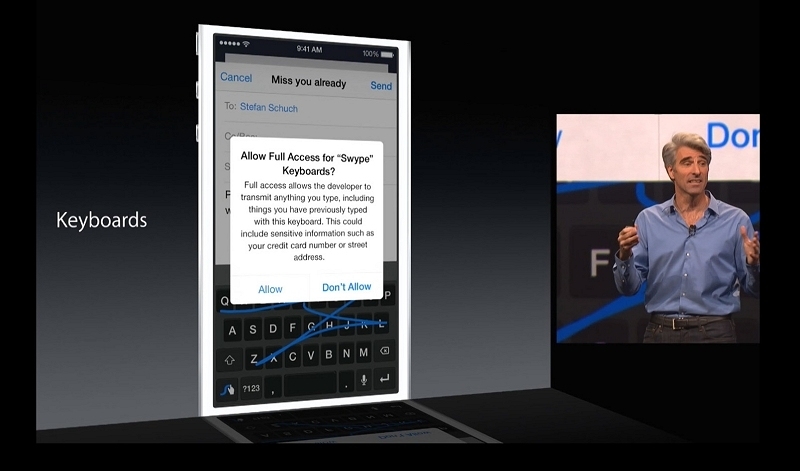 It works much like Swype in that you drag your finger across the virtual keyboard to type. It uses multiple artificial intelligence technologies to predict words you might want to type and can even draw from previous conversations to learn your style. Fleksy hasn’t been around for all that long but it’s still one of the most popular choices among third-party keyboard apps. The app, responsible for the world’s fastest texter, offers up an impressive autocorrect function, gesture support, themes and a collection of hundreds of emoticons to choose from. Do you prefer to use a third-party keyboard with your smartphone? If so, which is your favorite and why?